Vijay Iyer, Product Manager, Application Delivery Business Unit, will present Cisco’s Virtual WAAS (vWAAS) which provides on-demand orchestration of WAN optimization within a virtualized environment using VMware ESX and ESXi. 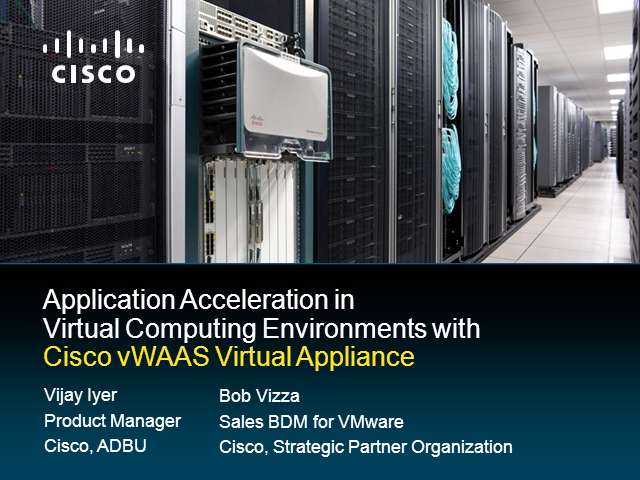 Vijay will cover the features and benefits of Cisco vWAAS and how to leverage it to deliver an excellent application experience over the WAN. This presentation will be available on-demand shortly after the live presentation.